Sharika Jolly says there was a time when her daughter was very unhappy with the way she looked. "Before she wanted her hair straightened and colored blonde," said Jolly. "I'm like 'No, baby. That's not you. This is who you are. You don't have to be like anyone else but yourself.' And I feel like she should be comfortable in her own skin." Jolly says she wanted Makiyah-Jae to love and accept herself just the way she is, so she bought her a t-shirt that says "Black Girls Rock." Black Girls Rock is a nonprofit organization that promotes empowerment and mentoring among black women. Makiyah-Jae has worn the shirt to Popps Ferry Elementary many times, but recently came home from school in a different shirt than the one she left the house wearing. Concerned, Jolly called the principal. "When I asked him what was the reason for him taking the shirt off of her, he said, 'You're right. It's not in the policy. Nowhere in the policy does it state that the shirt is out of dress code,'" said Jolly. "He said they made a judgment call, then I proceeded to ask well who are the judges judging my eight year old. And he said 'Well, I'm the principal so I made the call.'" Jolly says after she complained an administrator for the school district, the school called on Thursday to apologize. "It took two days but he did apologize,"said Jolly. "I accepted the apology, but my concern is how many other kids have been discriminated against at that school and their parents have not spoken up." Biloxi Schools Superintendent Arthur McMillan says it was an overreaction that the principal later realized. "The principal said they got to thinking about it. We were trying to avoid a conflict. In today's world we think about all the politically correct things that we don't want to offend anybody; probably overreached in this situation. In our school we don't do a dress uniform." McMillan says since there is no school uniform, school officials sometimes have to decide on appropriateness. "We probably overreached in this situation, but we make many decisions every day. Sometimes with decisions we make even as parents, we go back and look and think I wish I'd made that decision different. I think that's the situation here," said McMillan. "If he could make that decision again, he'd probably say 'Hey, you know that's not a big deal,' but you're always guarding against how do we not offend anybody." 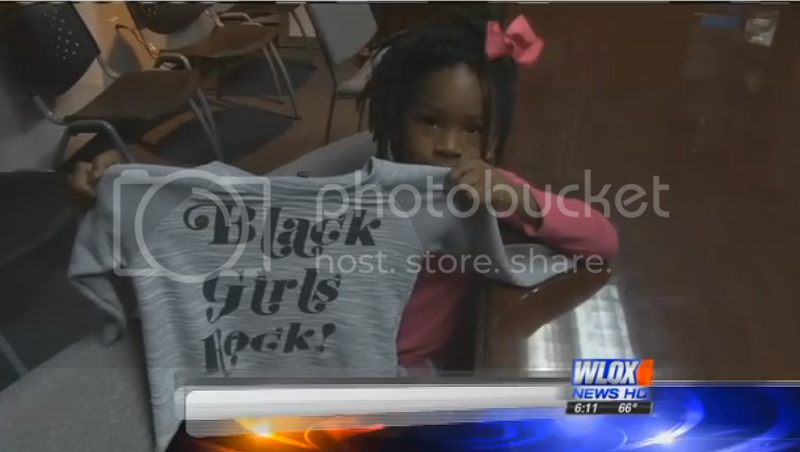 Makiyah-Jae is now free to wear her "Black Girls Rock" shirt to school, and a family friend has promised to gift her a new one as well.